craft beer on tap at your event served from a vintage land rover ambulance! "Soldier of the Great Pour is a serious good time." "Everybody loved the truck and service in style is very inviting. Soldier of the Great Pour is a gathering place. 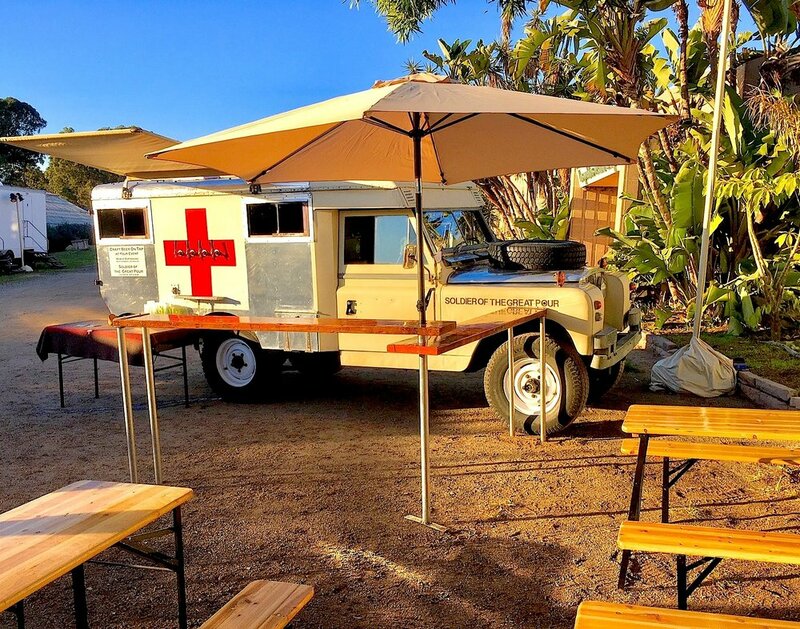 Where can you get a Land Rover Ambulance to serve tasty Beer? Right Here! It's the Indiana Jones of Craft Beer?" Soldier of the great pour is a mobile bartending service serving craft beer on tap at your event. from "the Ambulance" a 1966 right hand drive ex-british military ambulance. We love bringing you an unforgettable craft beer experience. weddings, corporate events, music events, birthday parties, house parties, tailgating, promotions, etc. the event provides the alcohol. we provide the experience. we also serve, bottled wine & beer, champagne,soda, juice, and bottled water. we love breweries, we will help you find the right beers, and the amounts you will need for your event. we will pick them up and return them. we also have our own ice system.